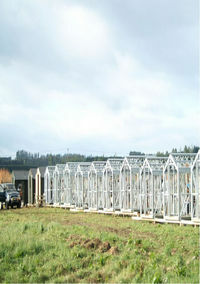 Frametek Southland Ltd and Don Hawinkels Builders Ltd have joined forces on a project for the Department of Conservation in Te Anau involving the supply of steel frames and construction of 13 flyable, re-locatable bivouacs. "The bivies will provide temporary homes for teams of track cutters, stoat trappers and deer hunters, all of which are involved in the battle to restore Resolution Island," says Hawinkels. Resolution Island is the latest of a group of islands in Fiordland identified by the Department of Conservation as 'Restoration Islands'. The plan is to rid the island of pests in order to protect the native plants and animals already on the island, and to provide a safe haven for many of New Zealand's more threatened species, such as Saddleback and Kiwi. After winning the tender to construct the bivvies, Frametek Southland Ltd and Don Hawinkels Builders Ltd, in consultation with the Department of Conservation, modified the original tender design proposal to take advantage of the benefits of Frametek steel framing. "Further enhancements due to the benefits of steel framing have reduced the amount of framing required and included built in bracing," explains Hawinkels. "This has resulted in a lighter and stronger structure." 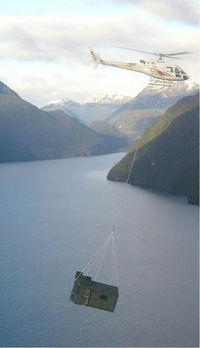 A lighter overall bivy has enabled Southern Lakes Helicopters Ltd to lift the bivy together with its associated timber framed annex, rather than move them separately as originally planned. "This has reduced the number of hours flying time required and has also made it easier to install and handle each unit on site proving that steel framing is both a practical and an efficient building material."